I have such an exciting week ahead planned with Stampin Up! Early Thursday morning will see me travelling to the airport to meet a fellow demo and friend where we will be catching our flight to Amsterdam for the three day event On Stage, Stampin Up's bi annual convention.Its always so exciting going to these big events. They are amazing and so well done. However, this spring its even more exciting. On Stage local is held in each respective country. The local event for the UK being usually held in Telford. 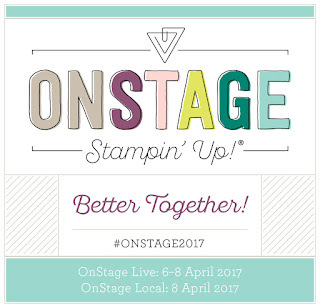 The On Stage Live event often held in Utah is much bigger, it spans two and a half days and moves. This spring it is coming to Europe and for European demonstrators replaces our local events. I know its going to be amazing. Its my first trip abroad with Stampin Up! Flying out very early Thursday morning and back late Saturday night. The spring On stage event heralds the reveal to Stampin Up demonstrators of the new product range for 2017 launched in the new catalogue in June. We get to see it way ahead, see the products demonstrated, the new "in colour" range, inspirational display boards, get to play with and pre order the new products in advance. We get a copy of the new catalogue and freebies too! All demonstrator perks.We keep the contents under wraps of course. Wouldn't want to spoil the surprise! I will be taking lots of photographs of course and will share those I am allowed. One of the fun things we so at these events is to take swaps. We create a card or 3D item and replicate it as many times as we like, we take them with us and swap with other demonstrators. This means we come back with a bag full of inspiration and goodies! I am currently in the middle of making my swaps and will post my progress over the next couple of days. Here is a sneak peek of what I am making. Look at all those colours! Love, love, love those Brights! This is a pic of my first ever On stage event. It was so much fun. I was fairly new to Stampin up then but I have made so many friends . We have dedicated social media groups that we use to connect, support and share ideas . I cant wait to catch up with lots of them at On stage. This is a pic of some of my wider team who attended On Stage last spring and gathered together for a craft event the day before. Stampin Up is so sociable and friendly and I love being a part of it. On Stage events are held every six months in April and November and there are other many events in the Stampin Up calendar in between to take part in . There is always something fun to look forward to. I will be back tomorrow to show you how my swaps are coming on! Thanks for stopping by.